This demo shows how FME Server and a series of other technologies can be tied together to deliver a realtime stream of data to a web application. Open both applications. Make edits to the polygons in the editing application, and instantly view the edits you/anyone else made in the display application without having to refresh. To make it a bit more fun I added a Twitter stream to the display application which shows a live feed of all the edits being made. A request is sent back to FME Server using JSON, it contains the geometry and either an INSERT, UPDATE or DELETE command. A database transaction occurs (INSER, UPDATE or DELETE) which triggers an Oracle trigger we setup. The trigger calls the D014-pushertrigger.fmw workspace crucially passing in the ID of the updated feature. node.js has a HTTP web server instance running which accepts the GeoJSON from FME and then sends the data to Pusher. Pusher is a hosted API for adding web socket support to your applications. The Pusher service takes the data node.js sent it and forwards it on to the display application. The display application takes the GeoJSON that has been sent and then performs and INSERT, UPDATE or DELETE. Sinup for an account at Pusher, it is free for sandbox development. Note you could configure your own Web Sockets setup on the server with node.js it is just a lot more complicated. 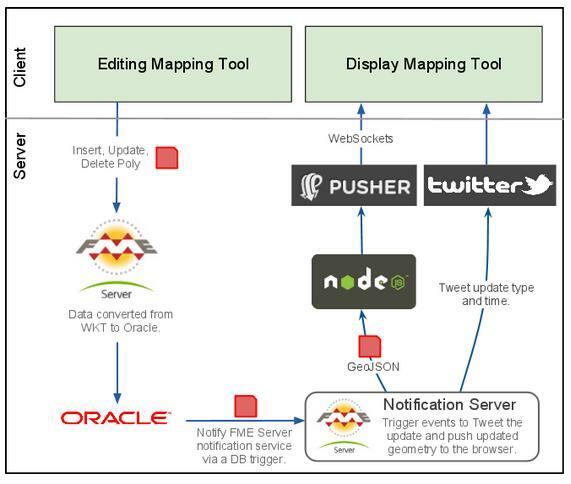 In the attached zip publish the following workspaces to FME Server. D014-pushertrigger.fmw: Publish to FME Server and register with the Job Submitter service only. D014-realtimedisplay.fmw: Publish to the FME Server and register with the Data Streaming service. D014-realtimeupload_v2.fmw: Publish to FME Server and register with the Notification service. You need to create a topic called pusher. You will need to edit all of these workspaces so they are using your OracleéFME Server credentials. Locate the Oracle scripts in the attached zip file(<Realtime>\Code\server-code\oracle) Each of these scripts will need to be edited to be made compatible with your environment. i.e. folder paths, usernames etc. Please review the inline comments in each of the scripts. This script creates the necessary Tablespace, Users, Roles, Grants, Tables, Sequences and Triggers for use with the for the D014 Notifcation Demo. Needs to be run as a DBA. This script will assist you in configuring the existing Oracle UTL_HTTP package for use with your network as well as the users that can access the package and unlike script 1 will need to be run as SYS DBA. This script creates the triggers on the table. 3 triggers actually make use of the UTL_HTTP package and a 4th trigger ensures the ID column is populated in the sample trigger using an existing sequence. You will need to place the HTML files (<Realtime>\Code\client-code) on a web application server. I used Tomcat which comes installed with FME Server, if you wish to do that then place the files here (<FME Server Install DIR>\Utilities\tomcat\webapps\ROOT). You will also need to update the client code to make sure the URL's which are used are pointing to your FME Server. You should then be able to run the demo by accessing the two HTML files above.